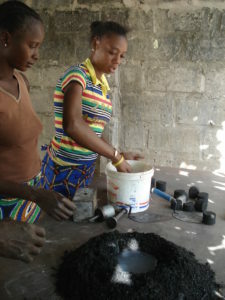 As part of the ongoing USDA-funded Cashew Enhancement Program (CEP) 2, team members collaborated on an innovative project in several villages in Senegal and The Gambia that demonstrated the viability of turning raw cashew-nut shells into briquettes that can be used as a fuel for cooking and heating. If this practice is adopted on a wide scale in cashew-producing regions, it can yield many important benefits for area residents. Household expenses can be reduced, health outcomes improved and a new industry created that provides jobs and incomes. Critically, trees that would otherwise be cut down for charcoal will be preserved. CEP 2A is designed to boost incomes in the region by helping cashew producers and processors increase their product quality and output. Cashew-nut shells are one of the by-products that are typically discarded during cashew processing. To explore opportunities to make a productive use of the shells, a key partner engaged to help explore opportunities to make productive use of the shells was Wasec Company Ltd, which commercializes recycled-waste engine oils in The Gambia. The company used a simple, low-cost and locally manufactured retort/kiln technology using 200-liter and 60-liter metal drums. The retort system is more efficient and environmentally friendly than traditional kilns because it recycles the gases created by the burning of the shells. Workers take the burned mass, pour it into molds, and press it into briquettes. 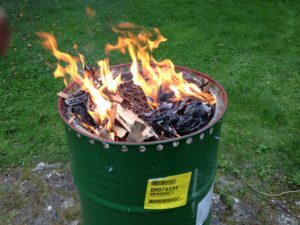 The burning efficiency of the briquettes is estimated to be three times higher than typical charcoal produced from trees. These advanced briquettes do not produce smoke and as a result are a healthier alternative for the women and children who are normally exposed to charcoal smoke during meal preparation. 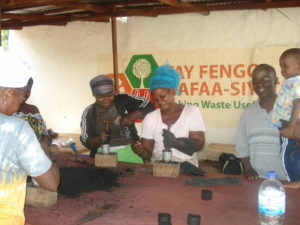 Other waste products or biomass such as coconut and palm seed can also be used as inputs for producing the charcoal. Five retorts are currently in use. Wasecoal is now looking at ways of up-scaling production following the brisk sales of the briquettes in the pilot project’s test markets.